Mike Sloniker was born on August 27, 1945, at Fort Sill, Oklahoma. He was commissioned a 2d Lt of Field Artillery in the U.S. Army through the Army ROTC program at Oklahoma State University on May 28, 1967, and went on active duty beginning August 1, 1967. After completing Airborne School and the Field Artillery Basic Officer Course, Lt Sloniker served as a Field Artillery Officer with C Battery, 2nd Battalion, 319th Field Artillery of the 101st Airborne Division in South Vietnam from 1967 to 1968. His next assignment was as a Gunnery Instructor at the Field Artillery School at Fort Sill, from 1968 to 1970, followed by Rotary-Wing Flight School at Fort Wolters, Texas, and at Fort Rucker, Alabama, from March to November 1970. He served as a Battery Commander with 6th Battalion, 92nd Field Artillery of the 2nd Armored Division at Fort Hood, Texas, from 1970 to 1971, and then as a UH-1H Iroquois pilot and Platoon Leader with the 174th Assault Helicopter Company of the 23rd Infantry Division at Chu Lai, South Vietnam, from July to October 1971. 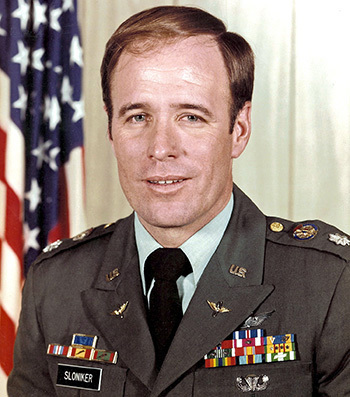 Capt Sloniker next served as Executive Officer and then Operations Officer of A Company, 229th Assault Helicopter Battalion of the 1st Cavalry Division at Bien Hoa Army Base, South Vietnam, from October 1971 to June 1972, followed by attending the Field Artillery Advanced Course at Fort Sill from July 1972 to June 1973. He served as Battery Commander of C Battery, 3rd Battalion (Airborne), 319th Field Artillery of the 101st Airborne Division at Fort Campbell, Kentucky, from July 1973 to June 1975, and then as a Liaison Officer, AH-1G Cobra pilot, and Operations Officer with 4th Battalion of the 77th Field Artillery of the 101st Airborne Division at Fort Campbell from June 1975 to May 1977. After completing AH-1S TOW Cobra transition training, Maj Sloniker served as an AH-1S and UH-1H pilot and as Operations Officer of the 501st Aviation Battalion at Katterbach, West Germany, from July 1977 to January 1978, and then as Company Commander of A Company, 501st Aviation Battalion of the 1st Armored Division at Katterbach from January 1978 to September 1979. His next assignment was as Executive Officer of the 501st Aviation Battalion from September 1979 to June 1980, followed by service as a Field Artillery Staff Officer and Combat Development Analyst with the Field Artillery School at Fort Sill from July 1980 to July 1981. He attended U.S. Army Command and General Staff College at Fort Leavenworth, Kansas, from July 1981 to June 1982, and then served as a Combat Development Officer in the Training and Doctrine Command at Fort Monroe, Virginia, from June 1982 to January 1986. LTC Sloniker next attended the Program Managers Course at the Defense Acquisition University at Fort Belvoir, Virginia, from January to June 1986, followed by service as an Acquisition Officer with the Deputy Chief of Staff for Research and Acquisition in the Department of the Army at the Pentagon from July 1986 to July 1988. His final assignment was as Special Operations Acquisition Officer in the Office of the Secretary of Defense, Special Operations and Low Intensity Conflict, at the Pentagon from July 1988 until his retirement from the Army on October 1, 1990. After his retirement from the Army, Mike served as Business Development Manager and then Director of the Army and Special Operations Sensor Programs with Lockheed Martin Corporation. For heroism while participating in aerial flight, evidenced by voluntary actions above and beyond the call of duty in the Republic of Vietnam; Captain Sloniker distinguished himself on 11 April 1972 during a mission to combat assault 650 ARVN soldiers into the besieged provincial capital of An Loc to relieve the onslaught of the advancing North Vietnamese units. Each flight into the landing zone was met by machine-gun fire and rocket and mortar attacks. The landing zone was never secure and every phase of the assault was met by intense hostile fire with several aircraft receiving extensive damage. Through his ability and courage he contributed immeasurably to the success of the mission. Captain Sloniker's outstanding flying ability and devotion to duty were in keeping with the highest traditions of the military service and reflect great credit upon himself, his unit and the United States Army.